If you are as in love with the Panda Pal as we are, get excited about what we have in store for you! Through the Accessory Genie Facebook Fan Page, we recently launched the Panda Pal Giveaway, where one lucky winner will get a GOgroove Panda Pal Portable Speaker System for FREE! To enter, simply visit our Fan Page (www.facebook.com/accessorygenie) and Like us, if you are not our Fan already, of course. A short and sweet entry form will appear for you to quickly fill out. And thats it! You have officially entered the Panda Pal Giveaway! If you dont know what a Panda Pal is, you don't know what you have been missing! The Panda Pal Portable Speaker System is one of Accessory Genie's most popular speaker systems, having surprisingly powerful sound quality in a panda shaped speaker that fits in the palm of your hand. A versatile portable speaker, the Panda Pal easily connects to any audio playing device with its 3.5mm cable, including mp3 players, laptops, netbooks, tablets, smartphones and other audio players. This innovative speaker system can also be powered through a USB cable or by three AAA batteries, making it a great option for portable sound or for desktop speakers. Despite its friendly and miniature appearance, the Panda Pal delivers outstanding sound quality through its powerful speakers. "The Panda Pal is definitely one of our most popular products," says Todd A., Director of Marketing at Accessory Genie. "It's a great speaker system for kids, or for the kid in you." An added bonus to entering the Panda Pal Giveaway is that as our Facebook Fan, you'll have access to the latest news in the tech world. In addition, you'll be the first to know about the latest products, accessories and gadgets available at AccessoryGenie.com, receive exclusive promotions, deals and offers from Accessory Genie, and interact with other tech loving fans like yourself! If you simply cannot wait a couple months to find out if you've won your very own Panda Pal, we have the solution! As our Facebook Fan, you get 10% OFF your next AccessoryGenie.com purchase! Once you Like us, click on the Offer tab and you'll get a code to use at checkout on any AccessoryGenie.com purchase you make, including the Panda Pal! Panda Pal Giveaway entrants have until Monday, June 20, 2011 at 11:59 PM (PST) to qualify for the Panda Pal Portable Speaker System Giveaway. A winner will be picked at random and notified via email on Tuesday, June 21, 2011. No purchase is necessary to enter. Entrants must be at least 18 years old and have Internet access, a valid e-mail address, and become a fan of the Accessory Genie Facebook page. Complete sweepstakes rules are available at http://www.accessorygenie.com/contest&action=rules.html. 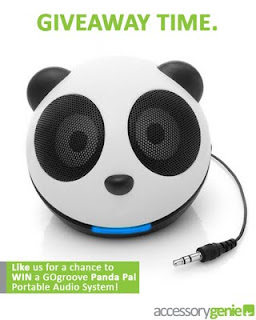 For more information on the GOGroove Panda Pal PortableSpeaker System Giveaway and to enter to win, visit the Accessory Genie Facebook Page at http://www.facebook.com/accessorygenie. For more information on the GOgroove Panda Pal and other Accessory Genie products, visit www.AccessoryGenie.com.